As predicted, today Google unleashed not one but two Chromecast devices. They’re both impressive, and they’re both still just $35. I just spent a little time with both of them and here are my impressions. 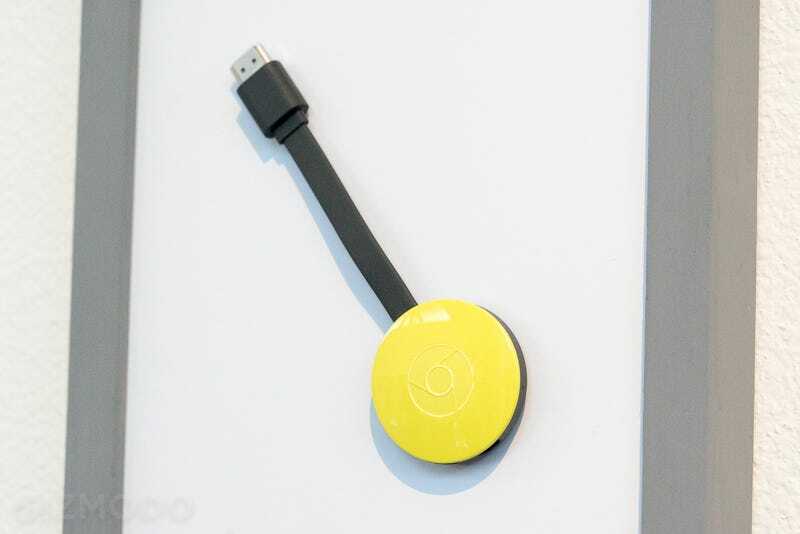 The new Chromecast is a funny little puck with a built-in HDMI cable. This is a good thing, as it makes connecting it even easier than it originally was–though you may want to use some double-sided tape to stick it in place to the back of your TV, just for aesthetic purposes. Aside from that, the only thing you should notice about the hardware is that it works better and streams faster than the original version did. The most significant improvement comes in the Chromecast app. Basically, the original app didn’t really do anything except connect and disconnect your phone from Chromecast. The new app leverages all of Google’s search-smarts and becomes a fully functional and thoughtfully laid-out content hub. Not only does it show you recommended content available to cast in the apps you have on your phone, but if you search for, say, Minority Report, it’ll let you choose whether you want the movie or the TV show. Pick which one you want, and then it will show you all of your options for watching. It will show you if it’s free on Netflix, two bucks on Google Play, or available on an app you haven’t yet installed. It was fast and incredibly convenient. I also got to try gaming on the new Chromecast with the Mario Kart-esque Angry Birds Drive. We enabled multi-player mode, created a game, joined, and then the TV became a split-screen race with our phones acting as a remote steering wheel (think Nintendo Wii’s wheel). We were on a super congested network, and so framerates weren’t as smooth as you’d hope, but the latency was low enough that I could steer through turns and around obstacles without a problem. In another room I checked out Chromecast Audio, and there isn’t really much to say–other than it worked as advertised and sounded excellent. It was plugged into an older Yamaha amp that was connected to a pair of speakers, and music played just as you’d expect. It’s definitely something I’d buy for my older stereo system if, y’know, I didn’t live in a van. I wasn’t able to try out multi-room play, which won’t be available until later this year, but when it is I really think it could eat a big bite of Sonos’ lunch. A lot of people already have stereos and speakers and don’t want to replace the whole system (in every room) just to get it internet-connected. Google’s solution for $35 a room is damn tempting. We should be getting review units of the Chromecasts today, so we’ll be back with a full review in the not too distant future.